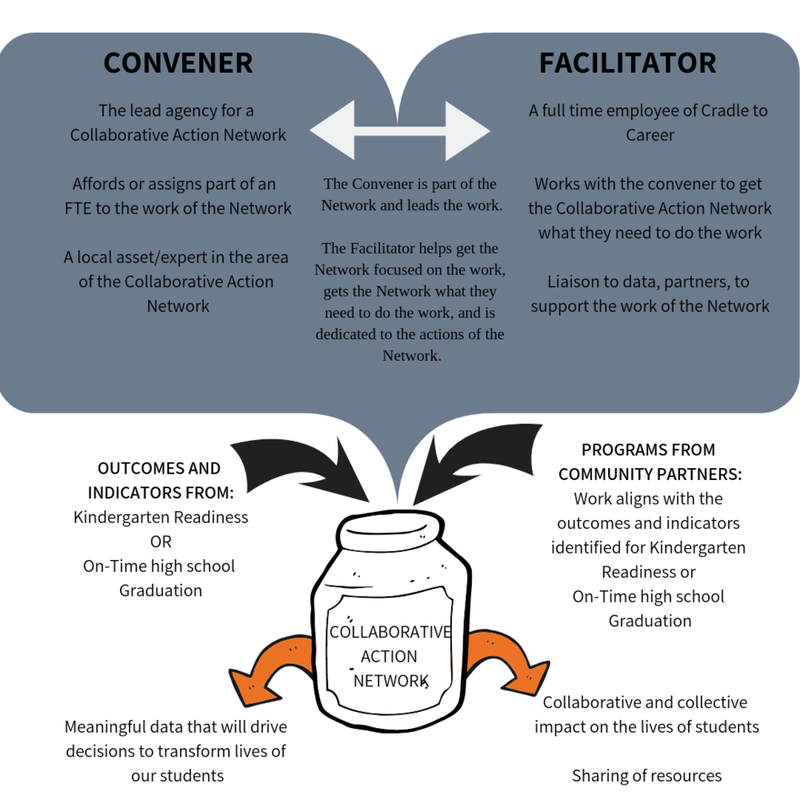 Collaborative Action Network: We shorten this to “Network” in conversation. The network is the list of partners who are working together on the outcomes and indicators of one of our seven benchmarks. Convener: The lead partner for one of our networks. The primary duties include organizing and aligning the partners to the prioritizes indicators within the network. They do this with the support of a facilitator. Facilitator: A full time employee of Cradle to Career dedicated to supporting the work of the assigned network(s). FTE: Full Time Employee, which is on average 8 hours a day, five days a week. DO I HAVE TO BE PART OF AN ORGANIZATION TO CONVENE A COLLABORATIVE ACTION NETWORK? Not necessarily, but as an individual, you need to show you have the expertise and the capacity to dedicate to the Network’s needs. Not through Cradle to Career. The Convener is the partner that aligns with the outcomes and indicators of the Network. Any compensation would come from the Convener organization. DO I HAVE TO DEDICATE A FULL TIME PERSON TO THE ROLE OF CONVENER? Not necessarily. Much of that depends on the momentum of the Network. We have other organizations who donate time to Cradle to Career in .15 to .5 FTE.